Considerable progress has been made in providing global access to antiretroviral therapy (ART), with over three million people currently on ART around the world. ART has proved efficacious in reducing mortality and morbidity related to Human Immunodeficiency Virus (HIV) infection; , however, is also associated with both short- and long-term drug-induced toxicities. These toxicities may reduce patient's quality of life and adversely affect treatment adherence; ,, and consequently may lead to treatment failure. Nonetheless, they are severely under- reported. In Nigeria, there are 359, 181 patients receiving ART as of December 2010 in over 200 secondary and tertiary hospitals, with plans to decentralize to primary health care level. However, information regarding the occurrence and types of adverse drug reactions (ADRs) in these patients is very limited. Spontaneous reporting of ADR is the foundation of national and international drug safety evaluation after licensing and approval for use in general population. It is a more popular method of pharmacovigilance, administratively simpler, covers potentially large and diverse population, and good for the identification of rare, serious drug-related or delayed adverse effects of medicines compared to cohort event monitoring. , However, under-reporting and strong biases in reporting are major problems with spontaneous reporting system (SRS). , Eluwa et al. reported that 45% of reported ADRs occurred within 12-24 months of commencing ART,  supporting the need for long-term monitoring of patients on ART for delayed adverse effects. Individual Case Safety Report (ICSR) is a notification relating to a patient with an adverse medical event or laboratory test abnormality suspected to be induced by a medicine. It is an essential source of information for the achievement of the main objectives of pharmacovigilance and can involve several ADRs. This study evaluated the ICSRs from a spontaneous reporting program in HIV-positive patients receiving ART in Nigeria. This descriptive study analyzed individual case safety reports (ICSRs) from a spontaneous reporting program in HIV-positive patients receiving ART between January 2011 and December 2011 in selected Nigerian hospitals. This study was conducted in 38 secondary hospitals providing comprehensive package of HIV prevention, treatment, care and support. These hospitals were selected from 20 out of 36 states plus Federal Capital Territory of Nigeria, and spread across the six geopolitical zones of Nigeria. HIV services are provided at no cost to the patients with funding from United States President Emergency Fund for AIDS Relief (PEPFAR) through United States Agency for International Development (USAID). SRS of the national pharmacovigilance program coordinated by National Agency for Food and Drug Administration and Control (NAFDAC) are operational in these hospitals. Suspected ADRs in patients on ART are reported using the national ICSR form (the yellow form). The original copies of ICSRs are forwarded to national pharmacovigilance center at NAFDAC for onward transmission to WHO Uppsala Monitoring Center while the duplicate copies are retained at the hospitals. All ICSRs in HIV-positive patients on ART between January 2011 and December 2011 in the study sites were included in this study. The ethical approval for this study was obtained from National Health Research Ethics Committee (NHREC), Federal Ministry of Health Abuja Nigeria. Confidentiality was assured by excluding patients' identifier during analysis. All ICSRs in HIV-positive patients on ART between January 2011 and December 2011 in the study sites were collated for analysis by researchers and trained research assistants. The national ICSR form (the yellow form) is a standard tool for spontaneous reporting of suspected ADR cases in Nigeria. This tool included sections on the patients' demographics, ADR description, treatment and outcome of reaction, suspected drug details and the concomitant medicines. The research assistants used patient identifiers to sort and filter out duplicate case reports and assigned a code to each of the patient's case safety reports before data entry. Data analysis was performed using Predictive Analytics SoftWare (PASW) statistics® version 18. Descriptive statistics including frequency distribution of key items and bivariate analysis was carried out to describe the relationship between reported ADRs and variables as age, gender and ART regimens. Chi-square statistic with Yates' correction was used to test the association between reported ADRs and patients' age, gender, and ART regimens. The association between reported ADRs and specific variables was assessed by an odds ratio (OR) at 95% confidence interval. The reported p values were 2-sided and p < 0.05 was used to determine statistical significance except where otherwise indicated. From 1237 individual case safety reports (ICSRs) in HIV- positive patients receiving ART collated from the study sites during the study period; only 1119 (90.5%) ICSRs were valid for analysis. Either or both key variables of interest (ADR description or/and suspected drug details) were missing in 118 (9.5%) ICSRs, and hence they were excluded in the analysis. The mean age of the patients who reported the ADR cases was 35.3 (95%CI, 35.1-35.5) years. 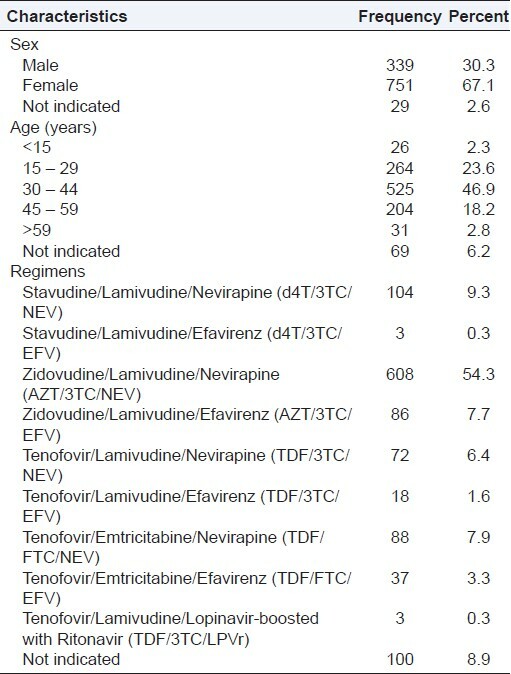 Of the patients, 67.1% were females; 46.9% were aged 30-44 years old; and 54.3% received Zidovudine (AZT)/Lamivudine (3TC)/ Nevirapine (NEV) regimen [Table 1]. There were a total of 1679 reported ADRs cases in these patients; an average (± Standard Deviation SD) of 1.5 (± 0.8) ADR cases per patient. 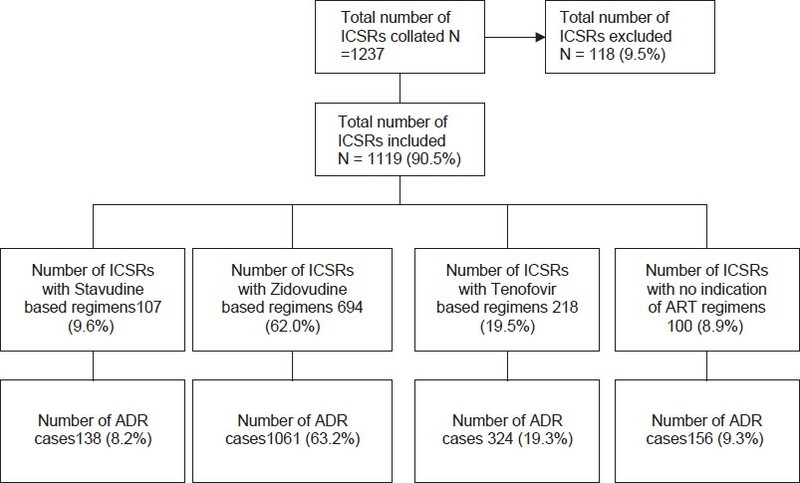 Of the ICSRs, 62.0% of the patients received AZT based regimens that constituted 63.2% of the suspected ADRs cases whereas 9.6% received Stavudine (d4T) based regimens that constituted 8.2% of the suspected ADRs cases [Figure 1]. 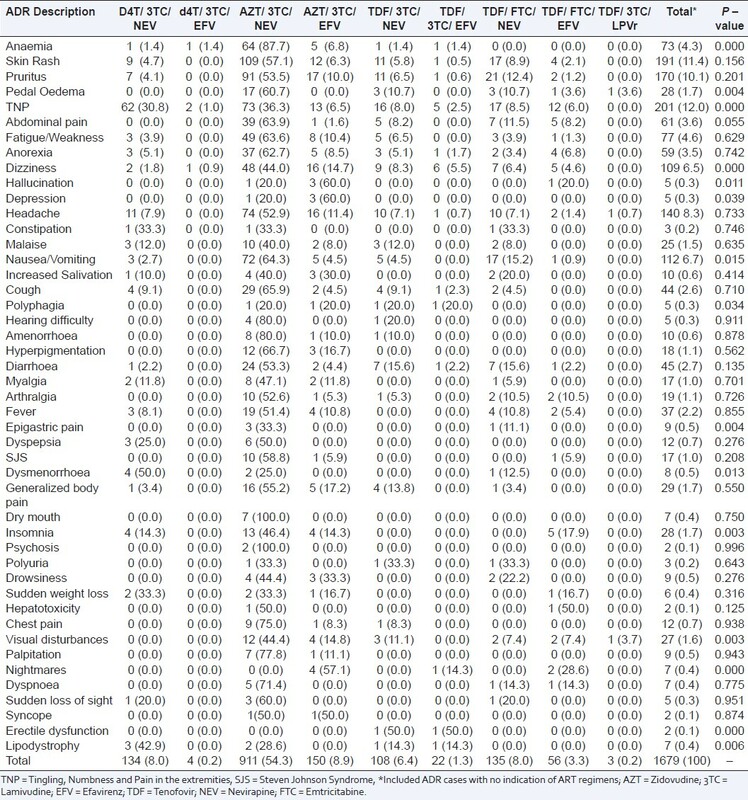 The suspected ADRs included (12.0%) peripheral neuropathy reported as tingling, numbness and pain in the extremities; (11.4%) skin rash, (10.1%) pruritus and (6.5%) dizziness among others [Table 2]. Although all patients included were onART, the specific ART regimens received by patients were not indicated in 156 (9.3%) of ADR case reports. The occurrence of the suspected ADRs was associated with ART regimens (P = 0.000), patients' age (P = 0.021) and concomitant medicines (P = 0.001). 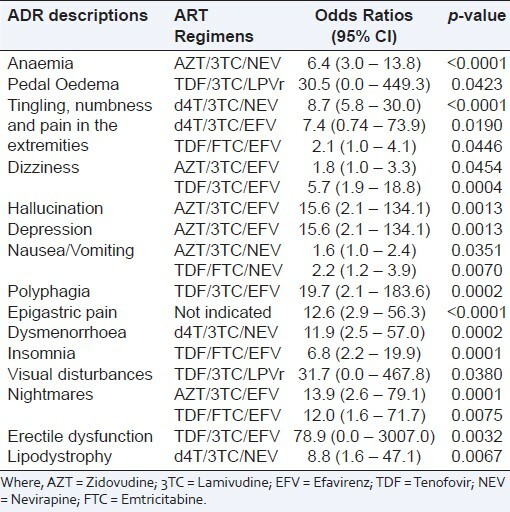 The suspected ADRs that were associated with ART regimens included anaemia [AZT/3TC/NEV, OR = 6.4 (3.0 - 13.8); P < 0.0001], peripheral neuropathy reported as tingling, numbness and pain in the extremities [d4T/3TC/NEV, OR = 8.7 (5.8 - 30.0), P < 0.0001; d4T/3TC/EFV, OR = 7.4 (0.74 - 73.9), P = 0.0190 and TDF/ Emtricitabine (FTC)/ Efavirenz (EFV), OR = 2.1 (1.0 - 4.1), P = 0.0446] - [Table 3]. Of the ADR cases, 47.8%, 24.4%, 17.0% and 2.6% were reported by patients aged 30 - 44, 15 - 29, 45 - 59 and >59 years old respectively. In 5.9% of cases, the age of the patients were not indicated. The suspected ADRs that were associated with patients' age included skin rash [<15 years, OR = 3.0 (1.3 - 6.6), P = 0.0056], peripheral neuropathy reported as tingling, numbness and pain in the extremities [45 - 59 years, OR = 1.9 (1.3 - 2.7), P = 0.0006], cough [<15 years, OR = 8.2 (2.9 - 22.1), P <0.0001], fever [15 - 29 years, OR = 2.4 (1.2 - 4.9), p = 0.0124] and visual disturbances [>59 years, OR = 7.0 (1.7 - 21.8), P = 0.0007]. Of the ADR cases, 61.1% and 13.3% were reported by patients taking Cotrimoxazole and Hematinics concomitantly with antiretroviral drugs (ARVs) respectively. 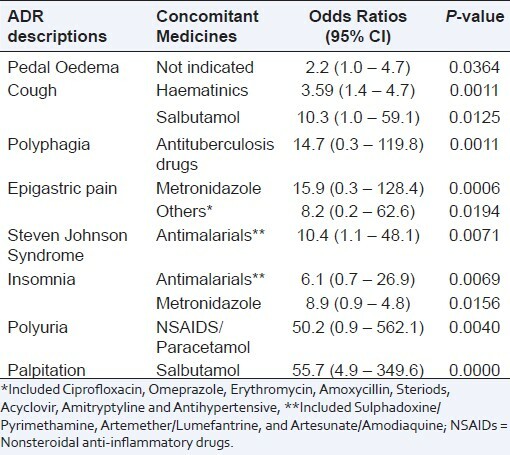 The suspected ADRs that were associated with concomitant medicines included palpitation [Salbutamol, OR = 55.7 (4.9 - 349.6), P = 0.0000] and polyuria [Nonsteriodal anti-inflammatory drugs (NSAIDS)/Paracetamol, OR = 50.2 (0.9 - 562.1), P = 0.0040] - [Table 4]. Overall, the occurrence of the suspected ADRs was not associated with gender (P = 0.548). However, when a test of association was done for individual ADR cases, some of the ADR cases had significant association with gender. These ADR cases were peripheral neuropathy reported as tingling, numbness and pain in the extremities [male, OR = 1.4 (1.0 - 2.0), P = 0.0334], headache [female, OR = 1.7 (1.1 - 2.7), P = 0.0125] and malaise [male, 2.7 (1.2 - 6.5), P = 0.0177]. The actions taken to manage the reported ADRs were indicated in 712 (39.6%) of ADR cases. These actions included 47.9% drugs initiated to treat ADR and 21.5% counseling on ADR management. Of these actions, 78.9% cases of blood transfusion and 23.8% cases of treatment stop were secondary to anaemia; 100.0% cases of dose reduction were related to skin rash; 33.9% cases of drugs substitution and 15.8% cases of a new drug initiation to treat ADR were related to peripheral neuropathy reported as tingling, numbness and pain in the extremities [Table 5]. Of patients who reported ADRs, 19 (1.7%) were hospitalized due to ADR whereas 515 (46.0%) were not. However, 585 (52.3%) did not indicate whether they were hospitalized or not due to ADR. Of patients who were already hospitalized, 46 (4.1%) of them reported that the duration of their hospitalization was prolonged due to ADRs. Of patients who reported ADRs, outcomes of ADRs reported were 208 (18.6%) recovered fully, 5 (0.4%) recovered with disability, 5 (0.4%) life threatening, 1 (0.1%) death due to ADR, 153 (13.7%) were still recovering at the time of ADR reporting whereas 747 (66.8%) did not indicate the outcomes. For those who recovered with disability, the nature of this disability was not indicated. The occurrence of the suspected ADRs was associated with ART regimens, patients' age and concomitant medicines. The study reported 4.3% cases of anaemia of which 94.5% were reported in patients who received zidovudine-based regimens. This is consistent with previous research findings that reported 3%-12% rates of zidovudine-induced anaemia. ,,,,, It is noteworthy that over three-quarter cases of blood transfusion and one-fifth cases of treatment stop were secondary to anaemia. Study findings showed that the occurrence of stavudine-associated lipodystrophy was 42.9% which is higher than 24.8% reported in a Rwandan cohort  but lower than 50%-63% reported in developed countries. ,, The occurrence of peripheral neuropathy in patients who received stavudine-based regimens was 31.8% which is higher than 10%-21% reported in developed countries ,, but lower than 56% reported in Malawi. Peripheral neuropathy was also found to be associated with tenofovir/emtricitabine/efavirenz regimen. This has not been reported previously to our knowledge; therefore close monitoring of patients receiving this regimen is very imperative. One-third cases of drugs substitution and one- sixth of new drug initiation to treat ADR were related to peripheral neuropathy. In general, the occurrence of ADRs was not associated with gender contrary to previous reports that female gender increases the risk of general ADR. , However; this is consistent with findings by Eluwa et al. which reported that gender was not significantly associated with ADRs. When a test of association was conducted for each reported ADR with gender, peripheral neuropathy and malaise had significant association with male gender; while headache was associated with female gender. The differences in the study findings may indicate a significant association of specific ADRs with gender and this need to be further evaluated. There were very few cases (<2%) of new hospitalization due to ADR. However, the duration of existing hospitalizations were prolonged by ADR in more (4.1%) HIV-positive patients receiving ART compared to those whose initial hospitalization was related to ADR. Less than one-fifth of patients who reported ADR recovered fully. This study suffered the same limitations of spontaneous reporting system (SRS) of pharmacovigilance. This included the limitations in the reliability of the data from SRS and severe under-reporting of ADRs which may under-estimate the occurrence of reported ADRs. No confirmatory clinical investigations were conducted at the time of the ADR reporting. This has the potential to over-estimate ADR occurrence if HIV or opportunistic infections related signs and/or symptoms was reported as ADRs. Data on seriousness or severity grades of the reported ADR cases were not available. This limited the analysis of the reported ADR cases by seriousness or severity grades. ADRs were less likely to occur in patients on stavudine-based and tenofovir-based regimens compared to zidovudine-based regimens. The commonest ADRs reported were peripheral neuropathy, skin rash, pruritus and dizziness. Peripheral neuropathy was also found to be associated with tenofovir. This has not been reported previously to our knowledge, and may require further evaluation. 1. World Health Organization, WHO (2008). Departments of HIV and medicines policy and standards; ARV drugs adverse events, case definition, toxicity grading and laboratory diagnosis. Geneva: WHO; 2008. 2. Coetzee D, Hildebrand K, Boulle A, Maartens G, Louis F, Labatala V, et al. Outcomes after two years of providing antiretroviral treatment in Khayelitsha, South Africa. AIDS 2004;18:887-95. 3. Agu KA, Ochei UM, Oparah CA, Onoh O. Treatment outcomes in patients receiving combination antiretroviral therapy in central hospital Benin, Nigeria. Trop J Pharm Res 2010;9:1-10. 4. Ammassari A, Murri R, Pezzotti P, Trotta MP, Ravasio L, De Longis P, et al. Self reported symptoms and medication side effects influence adherence to highly active antiretroviral therapy in persons with HIV infection. J Acquir Immune Defic Syndr 2001;28:445-9. 5. Fogarty L, Roter D, Larson S, Burke J, Gillespie J, Levy R. Patient adherence to HIV medication regimens: A review of published and abstract reports. Patient Educ Couns 2002;46:93-108. 6. Agu KA, Okojie O, Oqua D, King RC, Omonaiye O, Onuoha C, et al. Medication Adherence and Risk factors for non-adherence among patients taking highly active antiretroviral therapy. West Afr J Pharm 2011;22:19-26. 7. Hazell L, Shakir SA. Under-reporting of adverse drug reactions: A systematic review. Drug Saf 2006;29:385-96. 8. Federal Ministry of Health, FMOH. National Guidelines for HIV/AIDS Treatment and Care in Adolescents and Adults. Abuja, Nigeria: Federal Ministry of Health; 2010. 9. Heath KV, Hogg RS, Chan KJ, Harris M, Montessori V, O'Shaughnessy MV, et al. Lipodystrophy-associated morphological, cholesterol and triglyceride abnormalities in a population-based HIV/AIDS treatment database. AIDS 2001;15:231-9. 10. Bernasconi E, Boubaker K, Junghans C, Flepp M, Furrer HJ, Haensel A, et al. Swiss HIV Cohort Study: Abnormalities of body fat distribution in HIV-infected persons treated with antiretroviral drugs: The Swiss HIV Cohort Study. J Acquir Immune Defic Syndr 2002;31:50-5. 11. Saint-Marc T, Partisani M, Poizot-Martin I, Bruno F, Rouviere O, Lang JM, et al. A syndrome of peripheral fat wasting (lipodystrophy) in patients receiving long-term nucleoside analogue therapy. AIDS 1999;13:1659-67. 12. van Griensven J, De Naeyer L, Mushi T, Obarijoro S, Gazille C, Zachariah R. How common is lipodystrophy after at least 1 year of WHO first line antiretroviral treatment in Kigali, Rwanda [abstract WEPE0140]? In: Program and abstracts of the 16th International AIDS Conference (Toronto, Canada). Toronto, Canada: International AIDS Society; 2006. 13. Subbaraman R, Chaguturu SK, Mayer KH, Flanigan TP, Kumarasamy N. Adverse effects of highly active antiretroviral therapy in developing countries. Clin Infect Dis 2007;45:1093-101. 14. Moyle GJ, Sadler M. Peripheral neuropathy with nucleoside antiretrovirals: Risk factors, incidence and management. Drug Saf 1998;19:481-94. 15. Scarsella A, Coodley G, Shalit P, Anderson R, Fisher RL, Liao Q, et al. Stavudine-associated peripheral neuropathy in zidovudine-naive patients: Effect of stavudine exposure and antiretroviral experience. Adv Ther 2002;19:1-8. 16. van Oosterhout JJ, Bodasing N, Kumwenda JJ, Nyirenda C, Mallewa J, Cleary PR, et al. Evaluation of antiretroviral therapy results in a resource-poor setting in Blantyre, Malawi. Trop Med Int Health 2005;10:464-70. 18. Severe P, Leger P, Charles M, Noel F, Bonhomme G, Bois G, et al. Antiretroviral therapy in a thousand patients with AIDS in Haiti. N Engl J Med 2005;353:2325-34. 19. Anekthananon T, Ratanasuwan W, Techasathit W, Sonjai A, Suwanagool S. Safety and efficacy of a simplified fixed-dose combination of stavudine, lamivudine and nevirapine (GPO-VIR) for the treatment of advanced HIV-infected patients: A 24-week study. J Med Assoc Thai 2004;87:760-7. 20. Pujari SN, Patel AK, Naik E, Patel KK, Dravid A, Patel JK, et al. Effectiveness of generic fixed-dose combinations of highly active antiretroviral therapy for treatment of HIV infection in India. J Acquir Immune Defic Syndr 2004;37:1566-9. 21. Ananworanich J, Moor Z, Siangphoe U, Chan J, Cardiello P, Duncombe C, et al. Incidence and risk factors for rash in Thai patients randomized to regimens with nevirapine, efavirenz or both drugs. AIDS 2005;19:185-92. 22. Eluwa GI, Badru T, Agu KA, Akpoigbe KJ, Chabikuli O, Hamelmann C. Adverse drug reactions to antiretroviral therapy (ARVs): Incidence, type and risk factors in Nigeria. BMC Clin Pharmacol 2012;12:14. 23. Idoko JA, Akinsete L, Abalaka AD, Keshinro LB, Dutse L, Onyenekwe B, et al. A multicentre study to determine the efficacy and tolerability of a combination of nelfinavir (VIRACEPT), zalcitabine (HIVID) and zidovudine in the treatment of HIV infected Nigerian patients. West Afr J Med 2002;21:83-6. 24. Moh R, Danel C, Sorho S, Sauvageot D, Anzian A, Minga A, et al. Haematological changes in adults receiving a zidovudine-containing HAART regimen in combination with cotrimoxazole in Cote d'Ivoire. Antivir Ther 2005;10:615-24. 25. Shah I. Adverse effects of antiretroviral therapy in HIV-1 infected children. J Trop Pediatr 2006;52:244-8. 26. Barranco P, Lopez-Serrano MC. General and epidemiological aspects of allergic drug reactions. Clin Exp Allergy 1998;28 (suppl 4):61-2. 27. Riedl MA, Casillas AM. Adverse drug reactions: Types and treatment options. Am Fam Physician 2003;68:1781-91. 28. Singh H, Dulhani N, Tiwari P, Singh P, Sinha T. A prospective, observational cohort study to elicit adverse effects of antiretroviral agents in a remote resource-restricted tribal population of Chhattisgarh. Indian J Pharmacol 2009;41:224-6. 29. Olowookere SA, Fatiregun AA, Akinyemi JO, Bamgboye AE, Osagbemi GK. Prevalence and determinants of nonadherence to highly active antiretroviral therapy among people living with HIV/AIDS in Ibadan, Nigeria. J Infect Dev Ctries 2008;2:369-72. 30. Fletcher AP. Spontaneous adverse drug reaction reporting vs. event monitoring: A comparison. J R Soc Med 1991;84:341-4. 31. Agu KA. Establishing pharmacovigilance system in a clinical setting. In: King RC, Oqua D, Agu KA, editors. GHAIN Pharmacovigilance for Antiretroviral Drugs Training for Healthcare professionals, Participants' Manual. Silver Spring, MD: DAS, Incorporated; 2009. p. 71-85. 32. Brunlöf G, Tukukino C, Wallerstedt SM. Individual case safety reports in children in commonly used drug groups - signal detection. BMC Clin Pharmacol 2008;8:1. 33. Carr A, Vella S, Dejohn MD, Sorice F, Imrie A, Boucher CA, et al. A controlled trial of nevirapine plus zidovudine versus zidovudine alone in p 24 antigenaemic HIV- infected patients. AIDS 1996;10:635-41. 34. Warren KJ, Boxwell DE, Kim NY, Drolet BA. Nevirapine-associated Stevens-Johnson syndrome. Lancet 1998;351:567. 35. Mandelberg A, Krupnik Z, Houri S, Smetana S, Gilad E, Matas Z, et al. Salbutamol metered-dose inhaler with spacer for hyperkalemia: How fast? How safe? Chest 1999;115:617-22.